My family will tell you that I can spend hours surrounded by textiles. I love to look at bold-colored fabrics, and touch luxurious-feeling ones. I’m allergic to wool, and can’t stand being near anything scratchy or synthetic-feeling. I’m passionate about sustainability, and am appalled by the fast-growing waste we create. I obsessively recycle and compost, trying to reduce our household waste to the absolute minimum. That’s why I work exclusively with re-purposed fabrics. ANY Texture is my way of trying to keep exquisite textiles out of the landfill by turning them into beautiful, useful pieces of art. I also love traveling, seeing new places, learning about other cultures, and whenever possible–exploring different traditions of textile art. Sometimes I collect fabrics on trips, and try to design items around them. 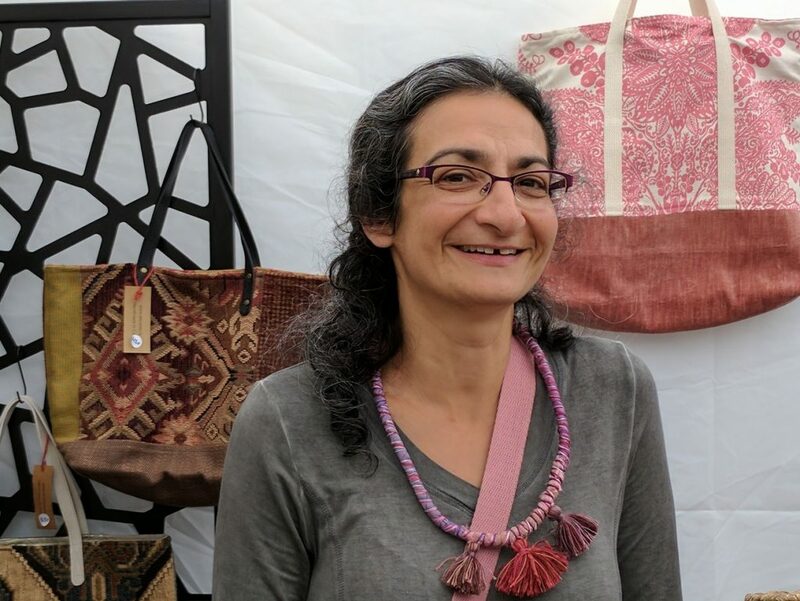 By doing so I try to give tribute to textile artists elsewhere, make connections between cultures, and create something new that reflects the reality of a small, connected world. My creativity is a dynamic process that required constant learning. I like challenging myself by experimenting, changing, and trying new things. I am always thinking of alternative ways to use my materials, new items to make out of them, and fresh substances to combine them with. Thus, my art feels like a continuous, evolving adventure. Besides being a textile artist and a designer, I am also a historian and a writer. I enjoy cooking, baking, and making my own jams and yogurt. I love spending time in nature, and savor gardening, hiking and camping. In addition, I highly value time with family and friends!